Autonomous driving will change the automotive industry and mobility as we know it. New transport systems and transport options are being developed already. And because of this the experience of traveling alone in one’s own autonomous vehicle will also fundamentally change. The idea that the time spent in a vehicle can be used for a range of activities is causing us to reevaluate what travel time means and the big opportunity there is to make that time efficient and satisfying. 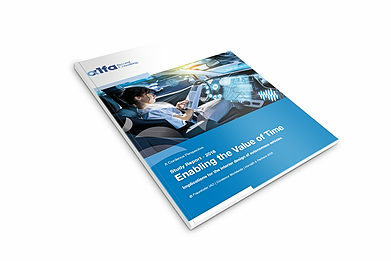 For this reason, we are pleased to share with you a new global perspective “Enabling the Value of Time”, a study by our Cordence partners, Horváth & Partners, that looks at the attitudes and requirements of future users of autonomous vehicles. This global study looks at the attitudes and requirements of future users of autonomous vehicles. It is easy to see the benefits that the vision of a self-driving car offers with regard to working persons, people who require assistance and children without a driver’s license: Mobility on demand and the opportunity to make efficient use of travel time by working or shopping, or by satisfying basic needs such as sleeping, talking, eating and drinking. With this study, our goal was to determine and record the attitudes and requirements of future users of autonomous vehicles with regard to using their travel time for more than just traveling. Central aspects during the process included user requirements regarding the design of vehicle interiors and the willingness to pay for individual equipment packages. You can download the complete perspective “Enabling the Value of Time” by clicking below. We hope you enjoy reading our findings and feel free to contact us if you have any further questions.